I came across a wonderful website with hidden treasures for those researching the Northumberland County of England. 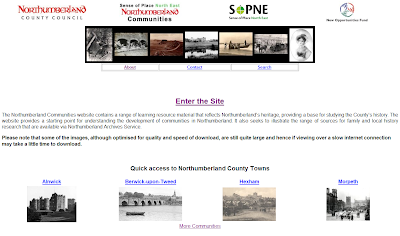 The website Northumberland Communities is designed for helping the reader understand the heritage of the Northumberland Communities by reviewing and learning about the history of the Northumberland county. The hidden treasures are located the descriptions, militia rosters, pictures and various documents that are available for each of the 76 communities located in the Northumberland county of England. The website states the following. "The project focuses on the history of 76 Northumberland communities – small ports, market towns, villages, larger towns and villages that have developed as a result of mining industries and one New Town. Original source material has been selected and digitised for each of these communities. This includes maps, plans, estate, court, church and school records, photographs and oral history recordings. It is intended that individuals, groups and educational establishments will use this digitised material as a starting point for understanding the development of Northumberland communities and that this material will provide a base for studying the County’s history. " Although the documents located on this site are far from a complete collection. I am posting this for the lucky ones that might browse through the documents and find their ancestors. For the rest of us, the historical information and pictures will help us to understand our heritage, the challenges they faced, and help us to pinpoint the 76 historical communities in Northumberland. If you have ancestors from Northumberland, love history, and learning more about the place and times of your ancestor, I would recommend checking out Northumberland Communities. Have fun learning!